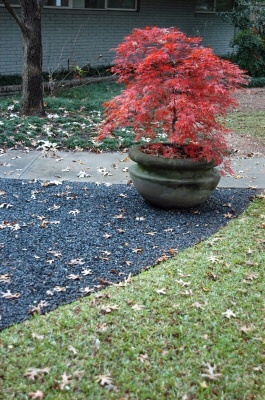 NATURAL HABITAT AND PREFERRED SITE: Japanese maple is native to Japan and China but adapts well to typical garden soils in Texas. It needs moisture and good drainage. Most of these trees prefer filtered light or morning sun with afternoon shade. The green Acer palmatum tends to be able to stand the most direct sun. 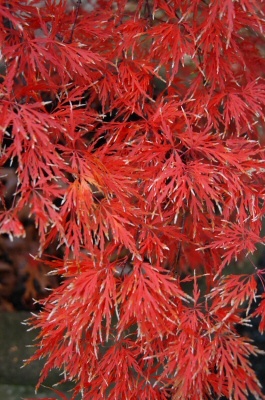 IDENTIFICATION INFORMATION: Japanese maples range tremendously in size, appearance, leaf texture and color from dwarf, lacy- leafed varieties to very tall wide-leafed varieties and cultivars. Fall color can range from yellows and gold to deep reds and maroons. FLOWERS AND FRUIT: Flowers of most Japanese maples are insignificant and the bloom effect comes from the unfolding of the colorful new foliage growth in the spring. The fruit is a typical maple samara (winged fruit) appearing in the late summer and fall. BARK: Ranges tremendously from green through various shades of gray and brown to even red bark on the Acer palmatum ‘Coralbark’. FOLIAGE: Japanese maple foliage is fascinating. The leaves range tremendously in size, shape and color. Some species have delicate, lacy, deeply cut leaves, and others are almost rounded and some resemble elm leaves. The color varies as much ranging from green to various shades of reds, pinks, oranges, and greens. Some varieties have string like leaves and several all variegated with dramatic combination of colors. 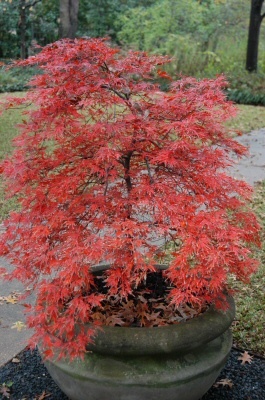 CULTURE: Most varieties of Japanese maple are easy to grow in Texas as long as they are given ample moisture and some protection from the hot afternoon sun. The red leafed varieties are the most susceptible to the foliage edges burning. When this happens there is really not much that can be done other than change the location of the plant. 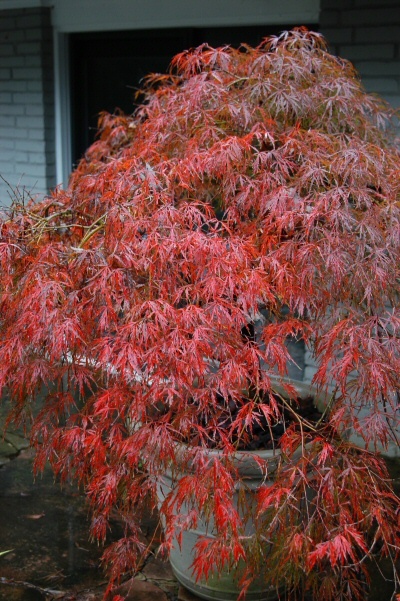 Japanese maples can be grown in pots. One of the best for pots is the A. palmatum disectum. 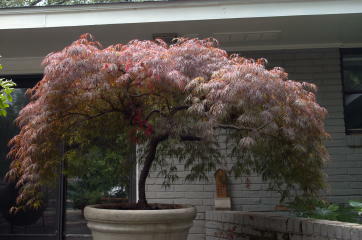 Japanese maple needs a moderate amount of fertilizer. PROBLEMS: Few other than the scorch of the leaves during the summer. In most cases cold damage is not a worry unless an extremely hard freeze follows a long warm spell and the plant has not had time to harden off. PROPAGATION: Done primarily from seed and grafting but also budding and layering. An excellent way to get exactly the Japanese maple you want is to do air layering. INSIGHT: Yes, it is an introduced plant but it adapts well into Texas gardens. ANSWER: Chicken wire arranged very loosely around the trunk would be fine as long as you promise to check it frequently to make sure it isn't touching or cutting into the tree. Apply my Tree Trunk Goop to the wound. This is a mixture of equal amounts of compost, soft rock phosphate and natural diatomaceous earth. Add water until the mixture becomes pastelike, and then slather it on the damaged area. Reapply after rain or sprinklers wash it off. Answer: The hole you describe is merely a cosmetic problem. The flare will grow in most cases and expand to fill the hole over time. Follow the rest of my Sick Tree Treatment procedure, which includes aerating the soil and applying organic amendments. The tree should respond next spring. The number of years required for the root flare to grow and fill the hole varies with the age and type of tree. Japanese maples are, as I assume you have figured out without my help, not from Texas. They are from Japan. Most of them prefer filtered sunlight, bright light under tall trees or morning sun with afternoon shade. Those are the conditions that most of my many Japanese maples have. On the other hand, my favorite of these wonderful trees is the mother of most of the hybrids and the one that could best take your conditions. 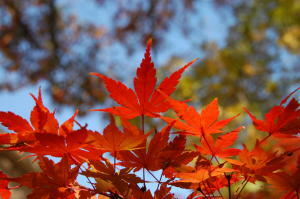 Acer palmatum is the basic green Japanese maple. It is a lime green during the growing season which is quite pleasant, but the fall color is dramatic. 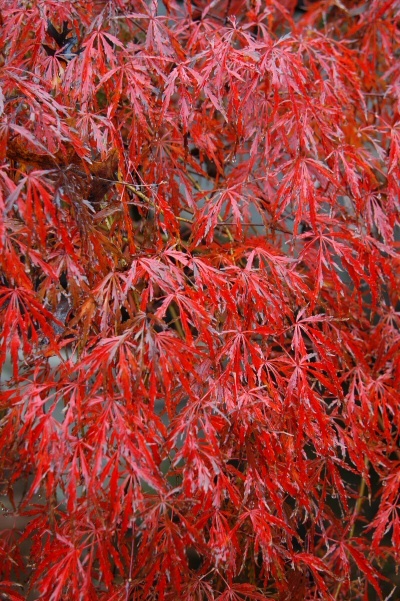 The foliage turns an electric red-orange that is a show stopper. This splendid little tree will grow even in full sun - as long as the soil is healthy, which of course comes only under a organic program.